231 pages | 84 B/W Illus. 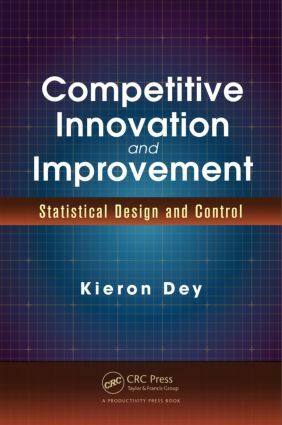 Competitive Innovation and Improvement: Statistical Design and Control explains how tocombine two widely known statistical methods—statistical design and statistical control—in a manner that can solve any business, government, or research problem quickly with sustained results. Because the problem-solving strategy employed is pure scientific method, it makes integration into any existing problem-solving or research method quite simple. The material in the book is presented in a manner that anyone can read and immediately put to use, including executives, managers, statisticians, scientists, engineers, researchers, and all of their supervisors and employees. Organizations can apply the concepts discussed with existing staff to release latent energy rather than adding to their workload. Optional footnotes provide the opportunity for more advanced technical insight. Supplying readers with an understanding of orthogonal design, the book illustrates key ideas through large-scale case studies. The book’s 12 case studies examine the coupling of statistical design with economic control across a range of industries and problem types. The book suggests the real world, rather than mathematics alone, to reveal how things work and how to make them work better. Innovation and improvement by design is explained, which will help readers open up left-brain analytics to more right-brain creativity. Although mathematics (as advanced as needed to solve the problem) is used throughout the text, it is translated into simple arithmetic without any mathematical notation. The book limits references to a few essential texts and papers that readers can refer to as they become more experienced in statistical design and control. —Dr. Randy Brown. Director of Health Research, Mathematica Policy Research, Inc.
Work that is way ahead of others… interesting and energetic writing. A lot of hands-on as well as technical wisdom – a very rare combination. The material is new, challenging, and important. A wonderful book with unique insights into an area of enormous potential. … not duplicated anywhere to the best of my knowledge. Writing style makes it easy to follow each topic. The concept is simple (it makes you wonder why others haven’t tried it). The large scale is unique … not discussed in current literature. What Might the Results Mean? Where Did Statistical Control Originate? What Might the Initial Results Mean? Where Did Statistical Design Originate? What Science Lies beneath Implementation Being the Hardest Part? Kieron Dey studied mathematics and statistics at Reading University, England and management at Rensselaer Polytechnic Institute, New York. He was on the experimental staff at Hirst Research Center, London, England (an early specialized center for applied scientific research), and apprenticed with Joan Keen, a pioneer in industrial statistics. He later joined IIT Research Institute, another contract research organization, serving in several roles including scientific advisor. He has held technical leadership positions in corporations up to $2 billion in size, now with Nobigroup Inc. He has vast experience with corporate and government leaders. Dey is a Fellow of the Royal Statistical Society.